Pat not only designed the quilt, but also designed the fabrics used for this heartwarming quilt. Enjoy using your paper piecing skills to make these adorable houses into a lovely village. 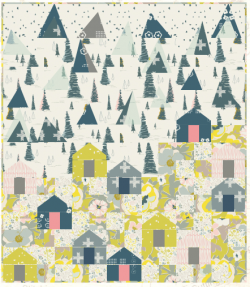 You will then give the quilt an even more picturesque feel by adding mountains to it. The quilt brings in Pat's Lugna Meadow fabrics and her Warm field fabrics. The two work together beautifully.